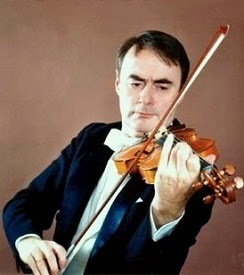 Gerard Poulet is a French violinist and teacher born (in Bayonne) on August 12, 1938. His father (Gaston Poulet), with whom he began his violin studies, was also a violinist. His career has been mainly spent in Europe though he has performed in almost every continent. He entered the Paris Conservatory at age 11 and graduated at age 12. His main teacher there was Andre Asselin. As did Bronislaw Huberman before him, he had many teachers: Zino Francescatti, Nathan Milstein, Yehudi Menuhin, and Henryk Szeryng were among them. Poulet made his debut at age 12 playing the Mendelssohn concerto. He recorded the third concerto of Mozart at age 14 with his father on the podium. At age 18, he won the Paganini Competition in Genoa, Italy. As do all winners of that competition, he got to play Paganini’s violin, the famous Cannone. He later dedicated a good deal of time to teaching at the National Conservatory in Paris. In 2007, he began teaching at the University of Arts in Tokyo. He might not be there any longer since I could not locate his name on any faculty roster. Poulet played the 1720 Henri Marteau Guarnerius from 1975 until about 1988 and that violin is supposedly now owned by Maxim Vengerov, though I could not find a single public source to confirm that. His most famous pupil is most probably Renaud Capucon.